FRANKFURT, Germany--At Pro Light and Sound 2013, HARMAN’s Crown announced the introduction of the USBX, an accessory that enables Crown XTi, CDi and DSi Series amplifiers with a USB port to be operated via an Apple iPad/iPhone using the “Powered by Crown” App. The USBX allows Crown amplifiers equipped with a USB port to be controlled via Ethernet. 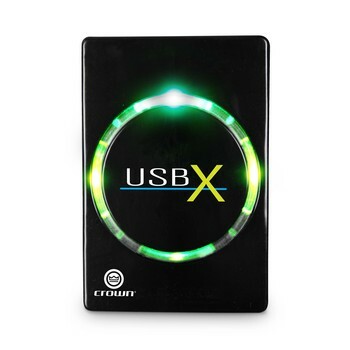 The USBX plugs into an AC outlet and up to eight compatible Crown USB products can be connected to the USBX. The USBX has built-in Wi-Fi, enabling wireless control of connected Crown amps via an iPad or iPhone and the “Powered by Crown” App without the need for a separate wireless router. The “Powered by Crown” App allows wireless control and monitoring of Crown Ethernet-enabled devices and JBL loudspeakers that are equipped with DrivePack® DPDA built-in amplifiers. Since this app uses the same protocols as HARMAN HiQnet System Architect™, users can import custom control panels from System Architect into the “Powered by Crown” App for added functionality. A strategic long-term commitment to Ethernet technology by Crown means that users have the benefit of this simple-to-use, cost-efficient program as well as seamless integration of their legacy and future Crown products through the app.